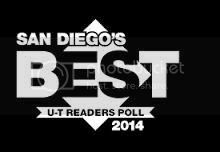 Dr. Herman Has Been Nominated For Union Tribune's San Diego's Best | Chris M. Herman D.D.S. This is the third year in a row that Dr. Christopher Herman’s Cosmetic and Family Dental Office has been nominated as one of San Diego’s Best.THANK YOU SO MUCH for all your support. Please help Dr. Herman’s office get voted in the top 3 again this year by voting each day. Voting is easy and quick to do. You can VOTE once per day through June 29th. Winners will be announced August 25th. *Simply enter your email to verify you are a real person. Thank you again for your continued support and time. It is greatly appreciated.